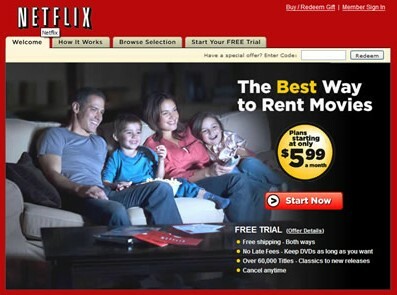 LOS GATOS, CALIF - (@The Comedy News) - Movie rental giant Netflix will be changing up their marketing campaign to target their services of streaming movies and mailing DVDs to families that always fight. "The divorce rate in the United States is currently at 50%. That's a huge demographic that Netflix can cater to," announced Netflix CEO Reed Hastings. "Netflix can be that avenue of solace for families that are always fighting." In the past, Netflix's marketing campaigns have included cliché photographs of healthy, happy, mother-father families with swell children. Marketing executives for Netflix have realized that those photographs could alienate the potential customers that are used to fighting at home. As a promotion for the new marketing campaign, Netflix will be offering free rentals of Mrs. Doubtfire, Kramer vs. Kramer, and any Steven Spielberg movie where there is a subplot of father-figure tension to customers who provide proof of divorce or domestic disturbance history.